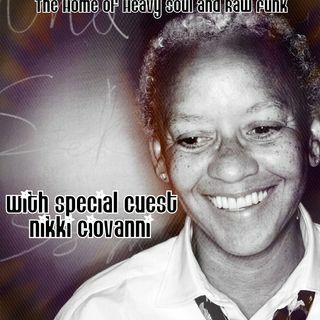 It’s an honor and a privilege to bring to the listeners of The Soul Brother Show – The Home of Heavy Soul and Raw Funk one of the greatest writers of all time, Nikki Giovanni. As a spoken word artist who has rocked the mic since 1997, I can’t begin to tell you how much it means to me to have this extraordinary artist grace this podcast with her words of wisdom as she waxes philosophic about her career as well as her thoughts on the Hip-Hop community. To round out this spectacular show are some ... See More of the greatest poets to ever grip a pen and a pad such as Maya Angelou, the Last Poets, and Rita Dove to name a few. As always, sit back, relax, and enjoy!